The St. Lawrence Seaway begins at Lake Ontario near Kingston and passes through the 1000 Islands then drops through a series of locks, 226 feet to Montreal and empties into the Atlantic Ocean. The massive construction project between the American and Canadian governments, the St. Lawrence Seaway was begun in 1954 and completed in 1959. The seaway connects the Atlantic Ocean to the Great Lakes and as far south as Duluth, Minnesota approximately 3,800 km away. There are actually 1864 Islands between Canada and the United States. The largest is Wolfe Island near Kingston, Ontario, the smallest being, well pretty small...a couple rocks with a tree. The Thousand Islands stretches for about 80 km or 50 miles from Kingston to Brockville. Designated as part of the Frontenac Arch Biosphere Reserve (http://www.fabr.ca) by UNESCO in 2002, this covers an area of about 2700 km of Eastern Ontario. The Frontenac Arch area basically extends in a triangle from Kingston to Westport and back to Brockville. Recreational opportunities here are everywhere! You will spend years exploring the Islands, the backwater bays and the Islands throughout. There are numerous shoals that you need to watch out for so plan for this with an up to date navigation chart or GPS system marking all the dangers of the river. There are excellent marinas along the Thousand Islands Parkway to launch or store your boat at. Take a trip from Blockhouse Island in Brockville, have a rest break and lunch at Ivy Lee or Rockport. Then take a leisurely drive about another 40 miles up the river to Kingston where you will find an endless variety of restaurants and things to do. Pack up the next morning or afternoon, whatever you feel like, and begin the boat trip up the Cataraqui and Rideau Lake System. A series of locks will bring you up and up to new lakes and new locations. Many miles (or over 200 km) later you will end up in Ottawa on the Rideau Canal. This needs no explanation for the things to do and see here! For an above water experience and a tour of the Islands, a boat cruise from Gananoque boat lines or nearby Rockport offers a close look at the Islands. A variety of cruise lengths are available including dinners. A stop at historic Boldt Castle on Heart Island is always a great trip. Canadian Visitors will require a passport as of June 1, 2009 as the Castle is in the US. 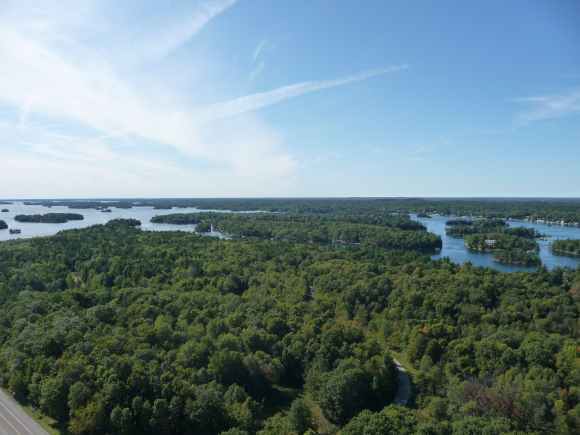 The 1000 Islands parkway allows visitors a glimpse of the islands between Gananoque and Brockville. For bicycle enthusiasts, the is a bike path that stretches the entire distance. For canoeing and kayaking trips the 1000 Islands water trail website provides great information for the routes in the area. Golfing, ATV tours, and numerous fishing opportunities including bass, walleye and the mighty musky are here! Each island has its own features such as stately granite cliffs, soft sandy bays, tall dark pines and vibrant maple trees – its a sightseer's paradise. Many of the islands are privately owned but numerous public access areas can be found at island parks and villages throughout the region. The family vacations and day trip opportunities are endless. Easily travel times from New York State, Toronto, Ottawa and Montreal there is no end to what you and your family can get up to!